There is no doubt that the Sportsmaster was available in Spring 1961, as Ilford advertise their new Sportsmaster in Modern Camera Magazine for April 1961. "All you do is press a button, and you can't go wrong with the Ilford Sportsmaster 35mm automatic. When you load a film you set the exposure control to suit the film speed. After that you merely point and shoot." Cameras & Equipment magazine announced the arrival of the Sportsmaster in their March 3rd 1961 issue, price £28.9s.8d (£28.48p). A de-luxe Ever Ready leather case cost an additional £3.4s.6d (£3.23p). Full camera automation came in with a bang at the Photokina exhibition in the autumn of 1960 (opened 24th Sptember 1960). (Photokina was originally a German photographic industry trade fair which started in 1950. By 1954 it had become THE international showcase for new photographic equipment (held in Cologne, April 3rd to 11th 1954). Photokina is still in existence, now held every 2 years at the Cologne Exhibition Center, Germany. The Sportsmaster was effectively unveiled at the 1960 Photokina, but not as the Ilford Sportsmaster. 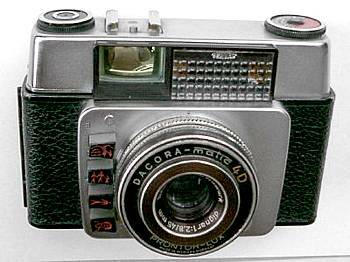 Since all Sportsman cameras of this era were manufactured by the Dacora company of Reutlingen in Wurtenberg, the 'Sportsmaster' first appeared at the 1960 Photokina as the Dacora equivalent, named the 'Dacora-matic 4D'. The 'D' in '4D' stood for 'Drucktasten', meaning push-button in German. 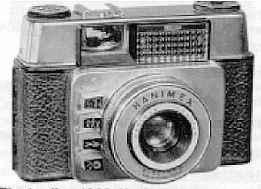 The magazine '35mm and Sub-Miniature Photography' in December 1960 joked that, when they first saw this camera with 4D within its name, "this was the miracle we were looking for. Surely, with such a name it could only mean that H.G.Wells's dream of the 'Time Machine' had at last become true, and here was a camera which could probe that elusive fourth dimension of the past and future. But...."
The above are two Sportsmasters, one the Ilford version and one the DACORA-matic 4D. Both have a Prontor-Lux shutter and Dacora Dignar 45mm f2.8 lens. To download a pdf of the instruction booklet, click the picture alongside. Be patient during the download as its a 2.5MB file. The film reminder dials differ. The LHS dial belongs to the Ilford and the RHS to the Dacora. "BERNHARD DANGELMAIER, a German citizen, of Gustav-Schwab-Strasse 6, Reutlingen, Baden-Württemberg, Germany, a fully responsible partner of the firm Dangelmaier & Co."
It was recorded at the European Patent Office under No. GB901018 on Nov 16th 1960, with the application originally made in Germany (No.31931) on Nov 21st, 1959 and a complete specification published date of July 11th, 1962. 10ASA selects 1/30s, 24ASA selects 1/60s, 50ASA selects 1/125s, 100ASA selects 1/250s and 200ASA selects 1/500s. The built-in selenium exposure meter then just selects the appropriate aperture, a selection which is visible in a small angled mirror in the top of the viewfinder. This was the simplest automatic system unveiled at the 1960 Photokina exhibition (see above), and was described by Amateur Photographer magazine's reviewer (12th October 1960) as "a simpler form of automation, used in many of the less expensive automatic cameras." The problem with this arrangement is that even in bright sunlight the exposure system selects an aperture between f8 & f11 and on an overcast day there can be insufficient light for automatic photography, even at f2.8. Although it is possible to turn the camera's selector dial away from 'Auto' and use the 'Flash' setting, which gives manual control of all apertures at a fixed 1/30s, it would take an experienced user to understand how this might extend picture taking in dull light. Since the camera is clearly aimed at a novice, it is doubtful such a course would be adopted, especially since, once the camera is turned away from 'Auto', the exposure system is turned off and gives no exposure guidance. When there is insufficient light, the visible indication in the viewfinder shows a red background to a 'lightning' symbol, advising the use of flash. As stated above, the 'Flash' setting decouples the automatic exposure system and enables all apertures to be manually selected at a 1/30s fixed shutter speed. Selecting the Bulb setting automatically provides a fixed, full f2.8, aperture. In April 1961 the lens was the 3-element f2.8 45mm Dignar but this later became the f2.8 45mm Cassar. Top view a picture taken with a Sportsmaster, click here and also, see these by Tony Kemplen (as suggested in his review of the camera in Amateur Photographer magazine for 5th January 2003). A 'Bennetts' advert in AP for March 1962 advertises the first Sportsmaster version (as above) with 'f2.8 needle sharp Dacora lens' for sale (supposedly shop soiled) at the reduced price of 19 guineas (£19.95p) with a mandatory de-luxe ever ready case an extra £3.8s.4d (£3.42p), against an original price of £28.17s.6d excl. case (£28.88p). In AP for 16th May 1962 Bennetts are similarly advertising a Dacoramatic for the same price as the Sportsmaster, (new, shop soiled) "Save nearly £9 - A proved winner." Dave Durnford, in New Zealand, has kindly sent me this scan which clearly shows a Hanimex version of the Sportsmaster, called the Electra II. The accompanying text (ex-McKeown's?) suggests it dates from around 1962. It has "a Hanimar f2.8 45mm lens in automatic shuttter coupled to Bertram meter". It was made (not surprisingly) by Dacora in Germany. It is probable this version was never marketed in Europe. 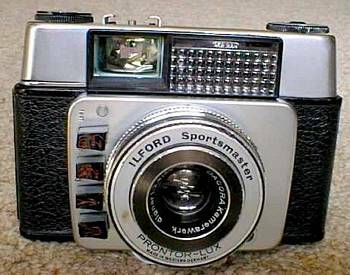 A later version of this camera is shown at the bottom of the Sportsmaster update page.